I recently went on a quick trip to Washington D.C. to visit my husband who's doing some research there. We did the usual touristy things, taking advantage of the plethora of free and interesting exhibits. 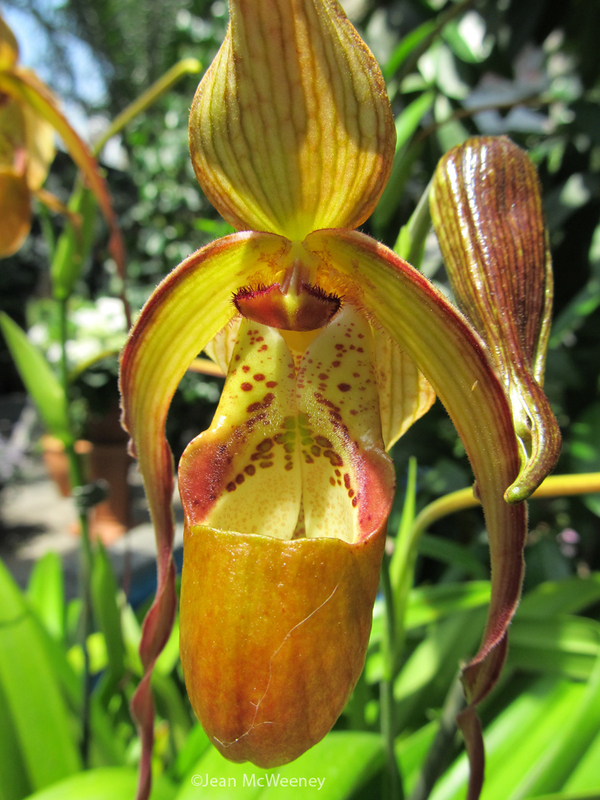 Of course, I had to take a quick trip to the U.S. Botanic Garden. The Botanic Garden was established by Congress in 1820, although the building at its current location was built in 1933. Outside the conservatory are some interesting garden vignettes. Every time I go there I think of how quickly the staff must have planted all those gardens, trying to get them going in time for the summer tourist season. This year the vignettes were not as fun for me as last time when they showed typical plants for each part of the U.S. I couldn't quite figure out what the theme was this year. Still, it was all interesting. How's this for an archway into the garden? Looks like fun but too much work for me! I wish I had a better long range photo of this yellow archway. 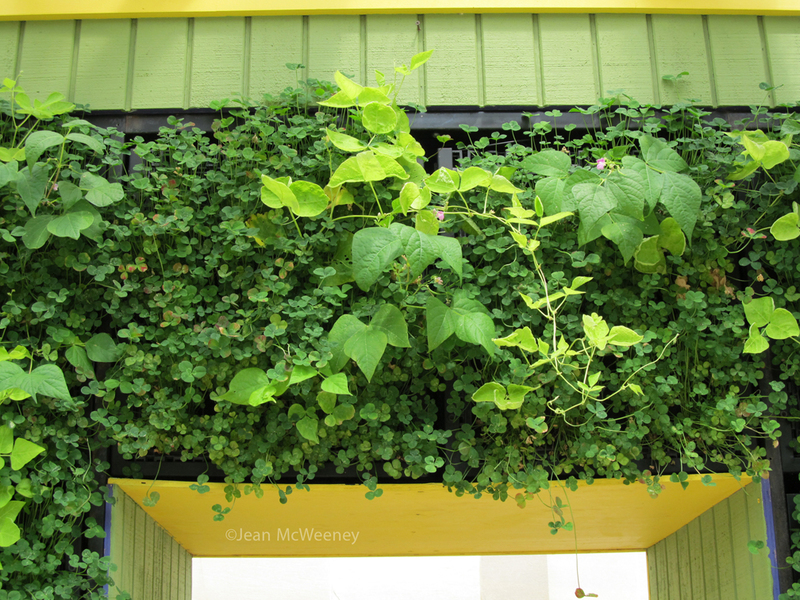 It was planted with oxalis and bean vines. Very fun. 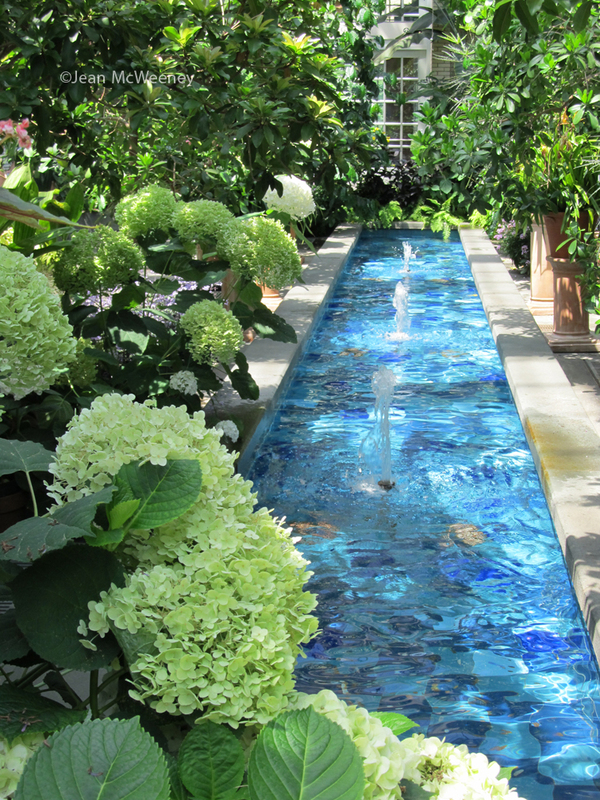 Once inside the conservatory, a beautiful, old, gigantic 1933 greenhouse, there are a couple of water features with loads of potted plants. 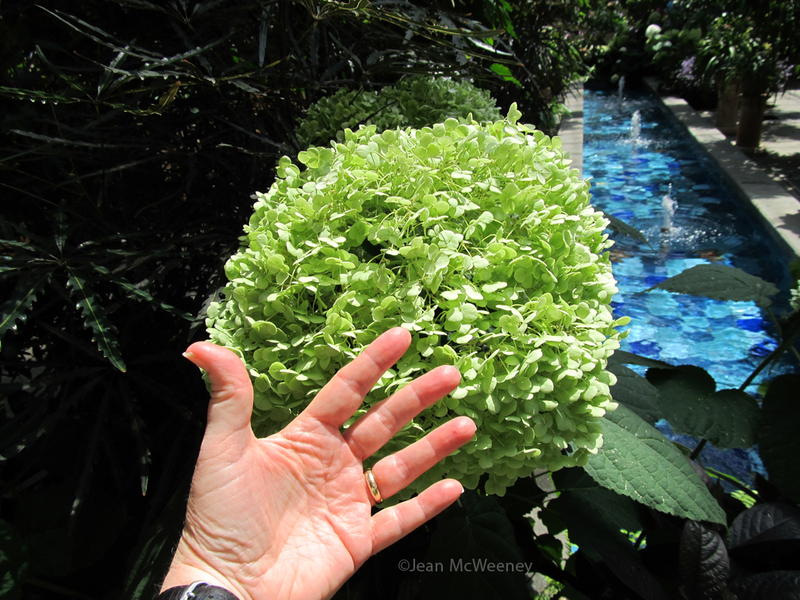 Look at the size of these hydrangea blooms (hand provided for contrast). Unfortunately I couldn't find the name of this one (most of the potted plants in this section weren't labeled) but I'm wondering if it is Invincibelle or one of those other giant hydrangeas. I swear the blooms were bigger than my head (that's big)! There are plants from all over the world in the conservatory. There was an interesting collection of begonias, some of which were in little bottles. 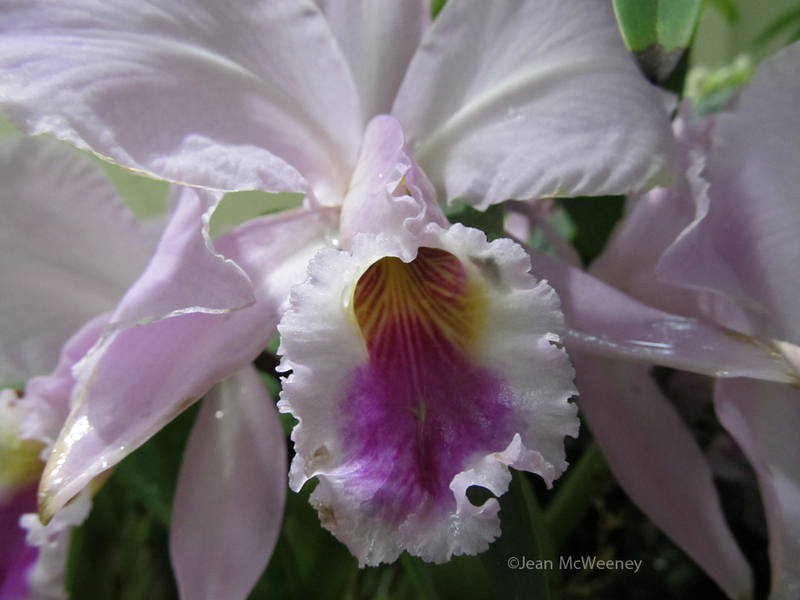 They have over 5,000 orchid specimens of which they display about 200 at any one time. I could have spent hours in there photographing them - they're all so strange looking! Outside the conservatory is the relatively new National Garden. 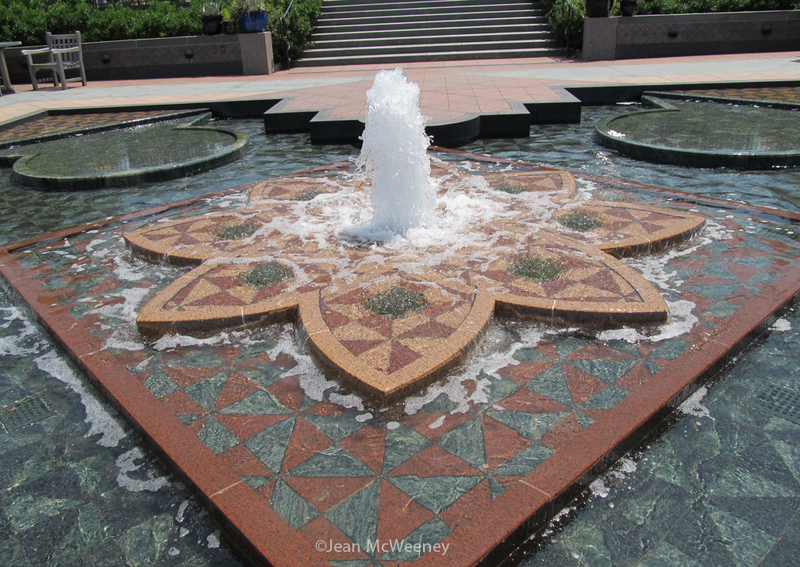 It's big and a great place to stroll with a rose garden, a butterfly garden, an amphitheater, a trickling stream and pond, places to sit, and this First Ladies' Water Garden, designed to showcase the important role water plays in plants, animals and humankind. It was pretty steamy by the time we got here, and I wanted to kick off my shoes and wade around a bit (but didn't since I was trying to be a bit dignified around are nation's grounds). I do wish I'd gotten to this part early in the morning. By the time we got here it was way too sunny for many photos, especially since I was carrying a new little compact camera that I wasn't real familiar with. We stayed right near the Capitol and I loved seeing all the tiny gardens in front of the rowhouses. Coming from the land of suburban yards, it's nice to see little postcard gardens for a change. I do encourage you to check out the Botanic Garden next time you're in DC. And check out all the other places along the Mall. It's a real national treasure. Is this anyway to treat a tree? And now for something completely different ... 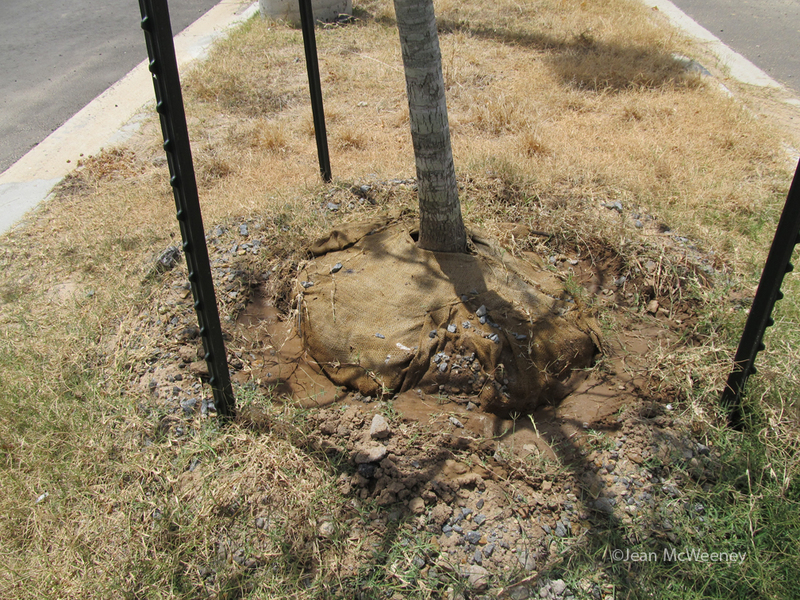 I had to whip out my camera in the parking lot of the airport when I got home to document this mess of a planting job. They're building a new terminal and have partially built a new parking lot, planting many new oak trees and crapemyrtles. Unfortunately, they were ALL DEAD!! I wonder why? Leaving the tree wrapped in its burlap casket with no dirt or mulch on top in the middle of an extreme drought ... Well, what more can I say? Lovely photos of the Botanic Garden! You did a much better job than I in showing all those beautiful plants and structures. And as for killing all those oak trees: Sad, sad, sad. You have piqued my curiousity about this though, so perhaps I'll have an opportunity to make a trip up to visit at some point. Nice photos...too bad the theme went undetected. What a beautiful place. I particularly like the long blue pool area. If I had a conservatory, that is what I would have! I loved this mini tour of everything and NO, that is NO WAY to treat a tree!!! This is an atrocity. Love the postcard gardens too. So fun to see fresh ideas. 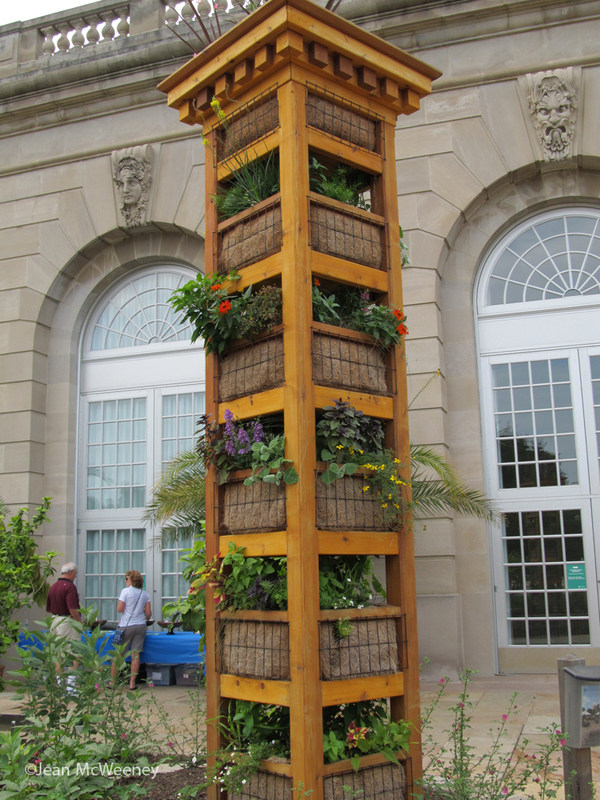 Re: fresh ideas...what WAS the theme at the Botanic Garden this year? That is definitely no way to treat a tree! 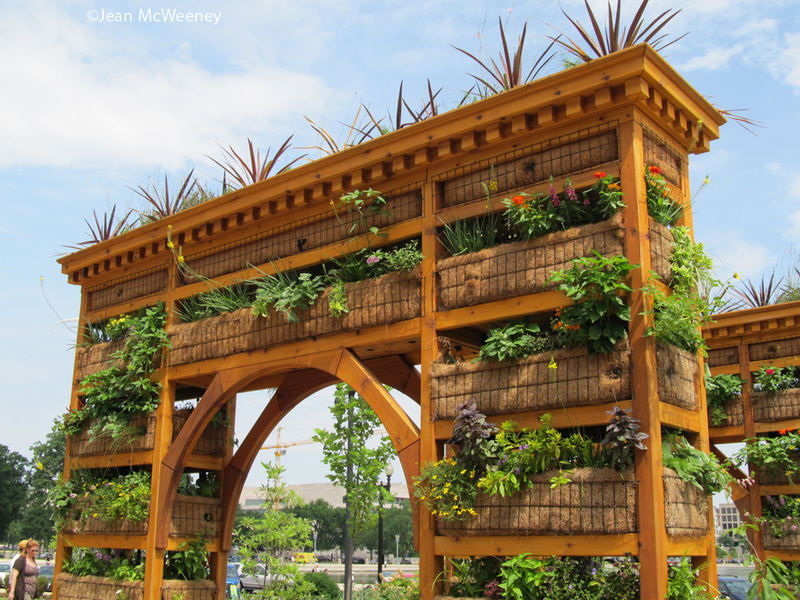 I love the US Botanic Garden, although those arches are a bit over the top. I hope they weren't supposed to demonstrate something we could do in our home gardens! 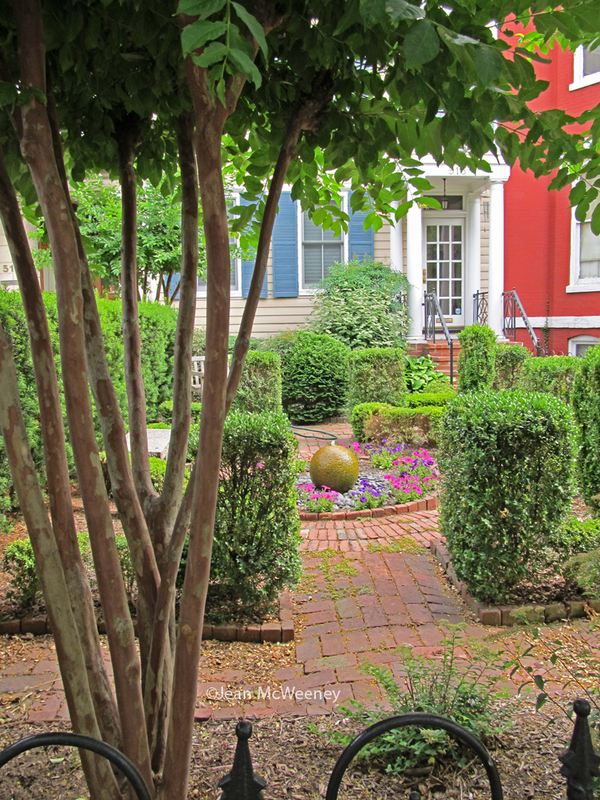 I like the small dooryard gardens in the older DC neighborhoods, too -- small gardens encourage folks to be creative, I think. Depressing to see those trees still in burlap - someone was pretty clueless. Thanks so much for sharing this--a friend went a few years ago and it looks like it's really grown since then. It's on my wish list, too, but dunno when I'll get to DC. 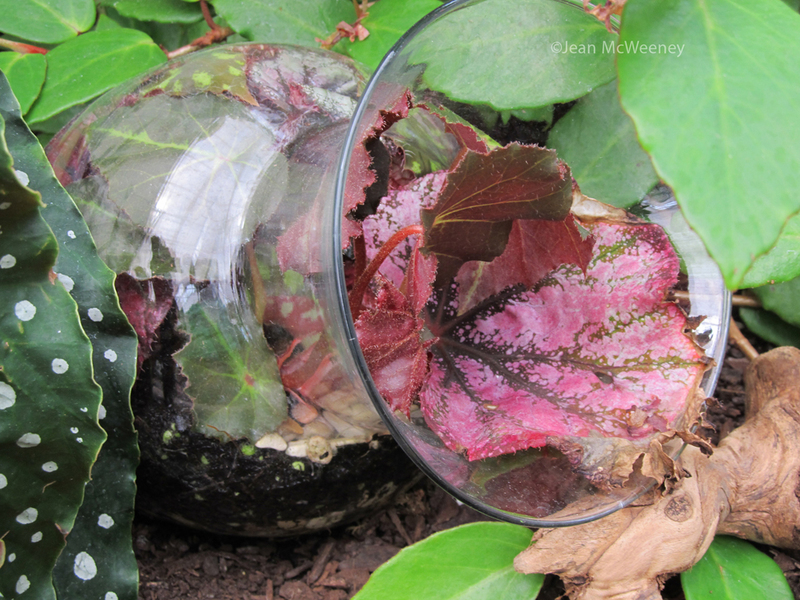 I love the planted arch and begonia in a bottle. So clever. I'll have to show him I found exactly what he wants to build....someday. Check out High Country Gardens Video Tutorials on Youtube!